One of my favorite activities to do in the warmer months is recycling paper. We save all of the unclaimed art and scraps of paper from other projects in a big tote. When we have a large amount, we fill the sensory table with scraps of paper and scissors. This first stage of the process often takes a day or so. The children are given the opportunity to come and go, cutting and ripping whenever they choose. 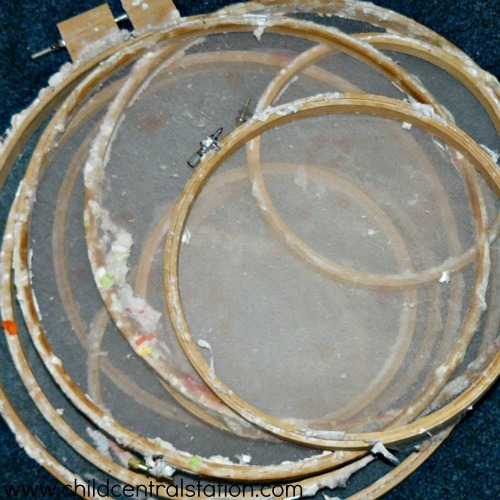 (Some people use a paper shredder if their goal is make homemade paper. We try to do our without the aid of electrical tools.) In order to make great paper, it is necessary to cut the paper into tiny pieces. The smaller the better. 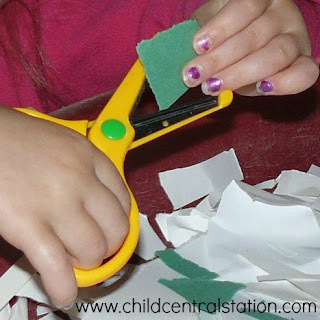 This give the children ample opportunity to work with scissors and to tear paper which is very important to building their fine motor skills. Then, when the paper is in tiny pieces, we add water. We pour just enough to cover up the paper scraps. The water is clear when we add it to the paper, but in order to recycle the paper, we need to work with the scraps and make the water cloudy. The paper will start to break up into "pulp" which is necessary to make good paper. 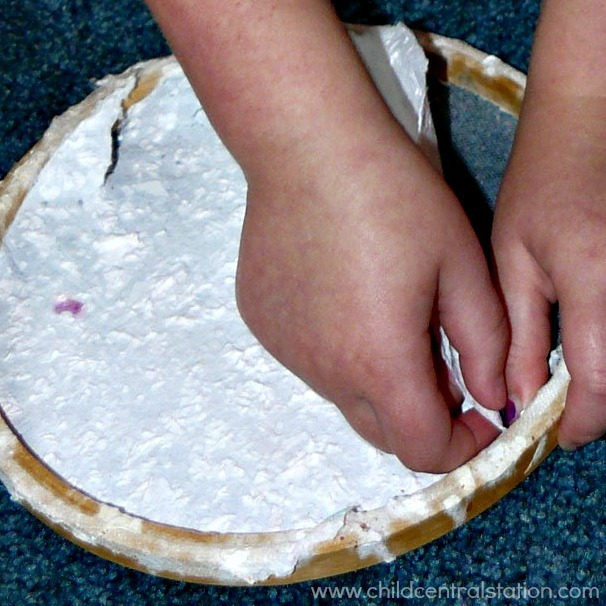 We "mush" and "squish" the paper between our fingers. We make it into balls and we tear it apart. The more we play with the paper in the water the more it breaks down. (Some people put this mixture in an old blender to help the process. We don't, we use our hands, and we play with the mix almost all day.) We usually let it sit for awhile and we come back to it again. The paper mix starts to look like oatmeal, and we add some more water to get it ready to place on the forms. 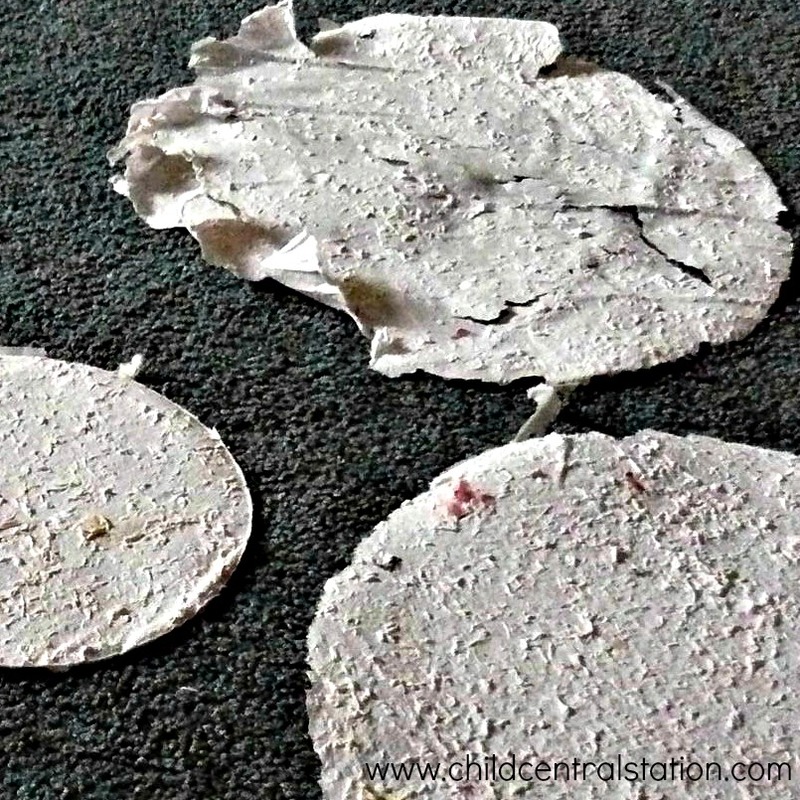 There are a lot of different forms you can use to put the paper pulp onto to dry. Some people use old window screens. We use embroidery hoops and tulle. Mainly because they are inexpensive and easy to adjust. (These forms have been used a number of times. You can see some of the residual paper sticking to them). Before we use the forms, we always take out some of the larger pieces of paper. We learned this by trial and error. If you have too many big chunks of paper, the recycled paper will be more like cardboard and it will be difficult to get a consistent layer of paper pulp in the form. We use some of our sand and water toys to do this, but you could use one of the forms or a colander. We scoop the water and paper mixture and drain the water. Finally, we are ready to put the pulp into the forms to make our new paper. This process is kind of like panning for gold. We place the form low down in the table and repeatedly move it back and forth. This process is fun and can be messy too! 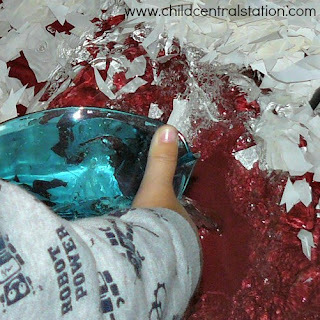 The movement creates waves and mixes the water, paper scraps and pulp. Children can often make HUGE waves and splash over the edge. This is part of the fun and the process, but we try to keep the water/pulp level low enough that we don't lose all of our hard work in the waves. When the child is satisfied with the movement and the pulp they are seeing, they pull the form up. If they can see through it, we encourage them to try it again. If there is not enough pulp in the form, the paper will be thin and difficult to remove from the frame. 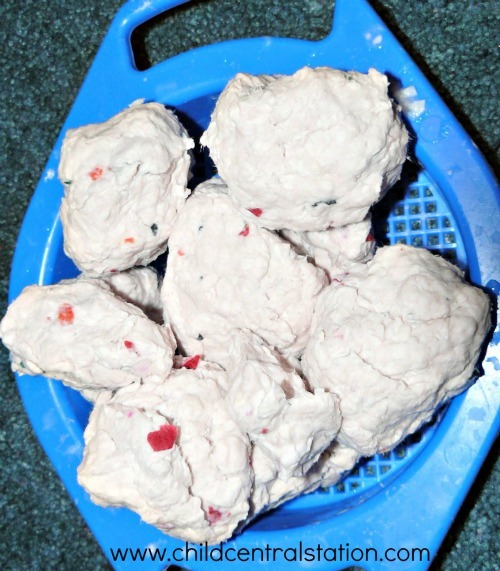 After they have had an adequate time to dry, you can remove them from the form. 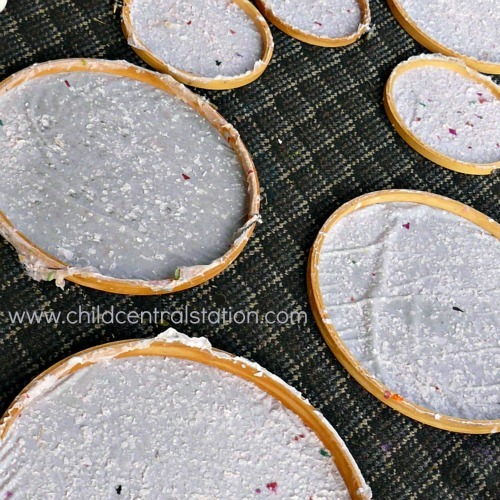 The best way to tell if they are ready is to rub on the tulle on the opposite side of the pulp. If you rub gently and the paper begins to separate from the tulle the paper is ready. If it does not, you need to let it dry longer. If the paper is too thin, it will not remove as one piece, it will easily tear. (You can see in this photo, some of our paper was too thin.). When this happens, we usually add the paper back into our scrap box or add it to the balls of pulp we use for sculpting. Some fun things we have done with our paper include making cool shape collages using scrapbooking punches, making great cards for our parents, or just coloring it with different mediums. The paper has a great texture and is fun to experiment with. 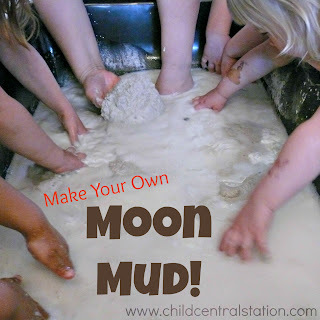 I will definitely be doing this with my pre-k kids! 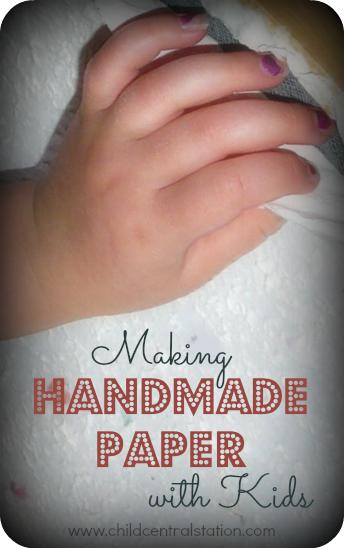 This is the best paper making tutorial I've ever seen! Thanks! i have wanted to make paper with my darlins for several years, but all the processes i saw were way beyond us for several reasons. but this, this is so do-able for us. what a great earth day project ! thanks. Thank you for the great compliments! I hope it works out well for all of you to try. We really enjoy the process here. What a wonderful hands-on experience! You made this very doable for preschoolers. I'll be they love using paper they made themselves. I also have it lined up to be tweeted and shared in facebook this week!! Thank you Beth! I will try to remember to link it up ;). Wow! I totally LOVE this post, Amy. Love that you do everything by hand (can't believe we've thrown out all of the paper scraps that the kids used for cutting activities this winter!!. 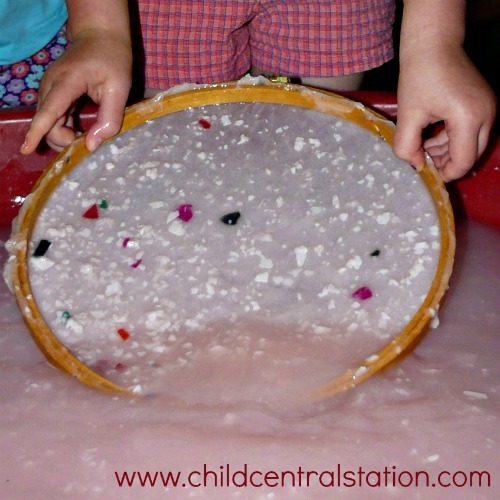 Sensory activity and learning experience all rolled into one here! Thanks Jackie! I'm sure you'll end up with plenty of paper to recycle soon- in our business it doesn't take long! Let me know how it turns out when you do get around to trying it!